Skip the line and save money! Travel with the Asian Public Transportation. Book your train, bus and ferry tickets in advance online via 12Go.Aisa. Pay less and skip the line at the travel agencies. From Koh Samui : There are at least 3 ferries a day from Koh Samui’s Big Buddha pier to Thongsala pier Seatran Discovery and Haad Rin Queen Ferry directly to Haad Rin. Boats also leaves from Nathon pier (Songserm Express) and Mae Nam pier Lomprayah) to Thongsala 3 times a day. From Koh Tao : get Songserm, Lomprayah or Seatran boats departs frequently from Mae Haad pier and arrives to Thongsala pier. 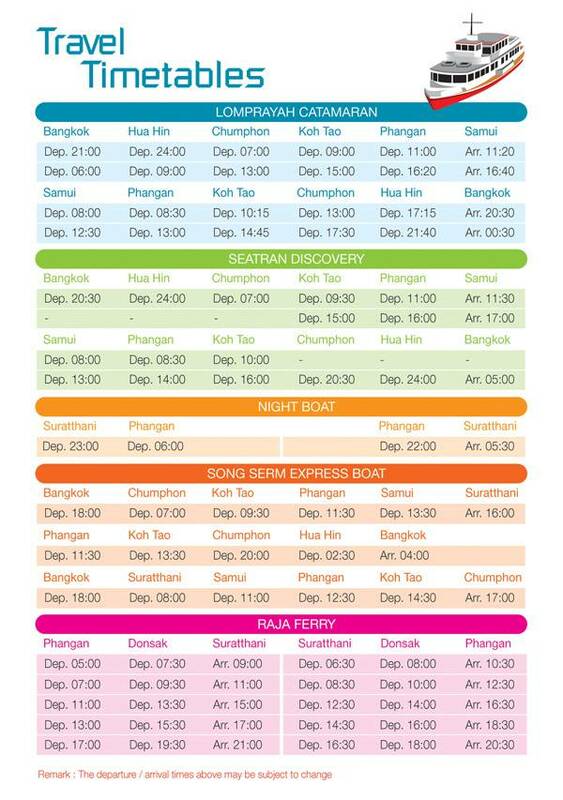 Last boat from Tao to Phangan Island is 15:00. From Bangkok : the cheapest way is take one of the overnight buses leaves Khaosan Road evening about 18.00 and in the next morning arrives Surathani, then take a boat.Bus and boat combo ticket can be arrange by travel agencies on Khaosan Road for about 700-900 Baht all the way to Koh Phangan. The nearest airport is Koh- Samui (USM) which has frequent flights from Bangkok (BKK) and Phuket, daily flights from Pattaya (U-Tapao), Singapore. Transortation to the ferry pier is easy to find at the airport. Ferries depart several times a day with the last one around 17.30.The next closest airport on the mainland is Surathani (URT) There are low-cost operators (AirAsia and Thai Airways) Then you’ll need bus + boat travel to get to Ko Pha Ngan, which takes a few hours. Taking overnight train from Bangkok with proper bed is also comfortable way to get Koh Phangan. Trains stop early morning at Surathani,than buy bus and boat ticket to Phangan Island. Train tickets from Surathani back to Bangkok should be reserved in advance specially in high season.